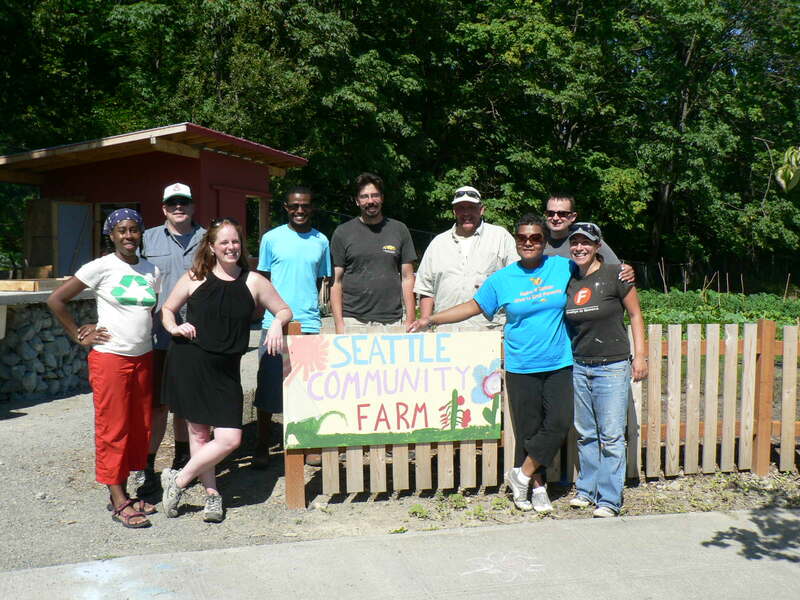 The Seattle Community Farm (SCF) is really something else. Most of my young adolescent life was spent going to school not too far away in Columbia City, but the neighborhood now is much more developed than it used to be. So I got lost. But three light rail crossings and two U-turns later, a large recently installed sign told me that I’d arrived to a narrow (1/2-acre) strip of land that would otherwise be overgrown with blackberry bushes and giantess maple-looking trees. The strip has been turned into a full-blown farm in which 100% of the produce goes to local residents of the Rainier Vista housing development in the Rainier Valley neighborhood and the Rainier Valley Food Bank. For the next three hours, I found myself beside complete strangers who had one thing in common with me: We came to work. We harvested tomatoes, cucumbers, green beans and zucchini. We prepared beds and planted spinach and bok choy. We cut back some invasive, thorny blackberry vines. And we did something adults don’t often like to admit: We learned. Scott Behmer is the SCF Coordinator. He told us all what to do with such enthusiasm and timeliness I had a feeling he was well versed in shaping up us (sometimes clueless) volunteers. And while we hacked at those pain-seeking blackberry bushes and burrowed our faces deep into the leaves of cucumber plants searching for ripe ones, Scott made a point to engage us in little-known facts about plants and the food system in Seattle. Like the fact that there are 29 food banks in Seattle (we all guessed around 10). As we prodded the thorny cucumbers, he asked us how long we thought the vegetables we picked that day would last at the food bank. A couple days, we guessed uncertainly? Actually, it was a couple of hours. That’s how in demand fresh, organic produce is in a community that cannot afford it otherwise. One other volunteer mentioned her experience seeing people in a pretty long line at a local food bank. All eight of us fell silent, looking for more ripe cucumbers that weren’t there. As city-dwellers, small scale gardening and urban farming can make us feel more connected to the food we eat. Being part of the growing and picking experience can put the food on our plate under an entirely different light. But planting, watering, nurturing and harvesting while knowing full well that you, yourself, will not be able to enjoy the taste of them (save a few rogue cherry tomatoes) – but that someone with little time and fewer resources will – well that adds an entire dimension of humanity to food. Think on that a while. But also keep in mind that there’s no standing around at the SCF. Get to work! This blog post was written by Emily Kuo, a Duke Engage intern who has been working with multiple departments at Solid Ground this summer, but with a focus in Supportive Services. The post originally appeared on the Duke Engage Seattle blog. Week four has come and gone. I can hardly believe that we’re past the halfway mark in our placements and our Seattle experiences. We’re in the thick of things now – our routines are set and projects are flooding in. What was once a vague suggestion of an action plan is now concrete and the deadlines very real. 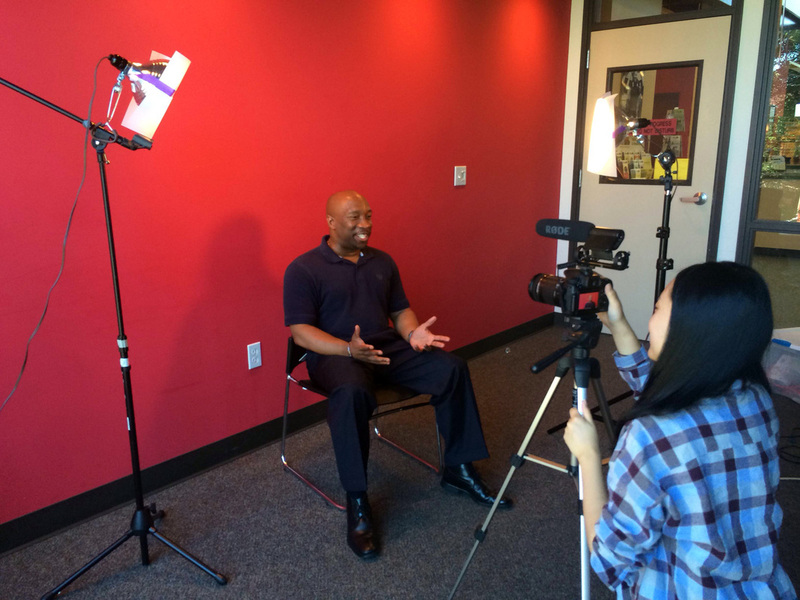 One of the main projects my community partners at Solid Ground was hoping for me to complete was a video that can be viewed by both the staff and the clients they serve to energize them about financial empowerment and how it could benefit everyone, staff and clients alike. 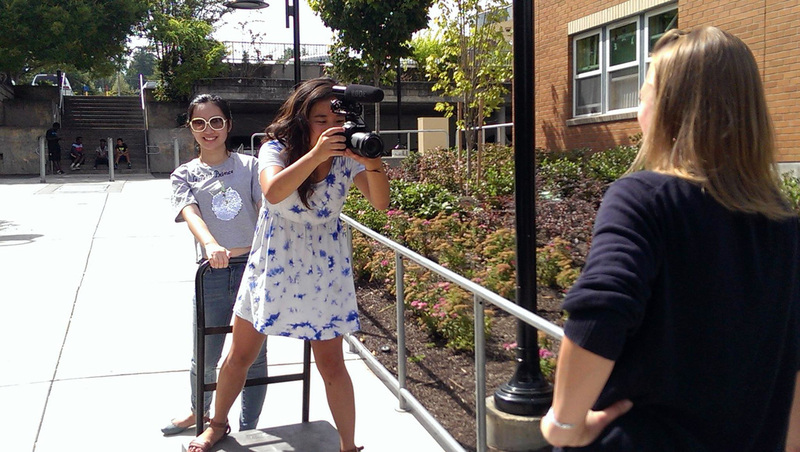 For the past three weeks I had been collaborating with Vera Zhang, the Duke Engage intern placed in the Communications Department of Solid Ground, to conceptualize, film, and edit the project. I had not met Vera until we were both in Seattle and discovered we were placed at Solid Ground. Our friendship developed into a trusting team dynamic as we learned that our placement supervisors wished for us to work on this rather large-scale project together. Teamwork is a tricky thing. It’s an ever elusive concept and a frequent buzzword flying around large corporations, small firms, and pretty much every social sphere we’ve been in since we were children. So what is it? What does teamwork mean to you? Is it all in the bottom line and whether your group accomplishes the goal, or is it something that permeates through every step of the creative process? To me, a great team doesn’t need to have fancy frills and titles. It doesn’t take multiple experts coming together to form a dream team. A great team can be as simple as two minds coming together, understanding the mutual end goals, adapting to whatever limits exist and balancing out the others’ strengths and weaknesses. It was a great pleasure working with Vera because we both wanted to do whatever it took to create a professional, high-quality output. Though there were some setbacks and limitations to the equipment and short timeframe, we both tried to think innovatively about how to overcome these trials and fed off of each other’s energy and enthusiasm. There were some rough moments during the process when we broke a light bulb and frame on the first day, but we were there to encourage each other despite the fact that we both wanted to cry in frustration. When we felt overwhelmed, we’d allow ourselves a pick-me-up at Molly Moon’s or our favorite sushi lunch. We allowed each other the time and space to recharge and reapply fully to the project. Moreover, as we worked intimately over the course of these last few weeks, I found that our strengths and weaknesses really complemented each other. Vera’s attention to lighting and detail were crucial in the ultimate high-level production, whereas I wouldn’t have weighed the importance of such things. I was much more focused on the lines and whether they felt natural or scripted, and finding the energy in each individual actor. Her skill in PowerPoint proved integral when she created beautiful animated infographics that appeared much more high-end than mere PowerPoint wizardry. Meanwhile, I edited the footage and music and we synthesized the two to create the final rough-cut. 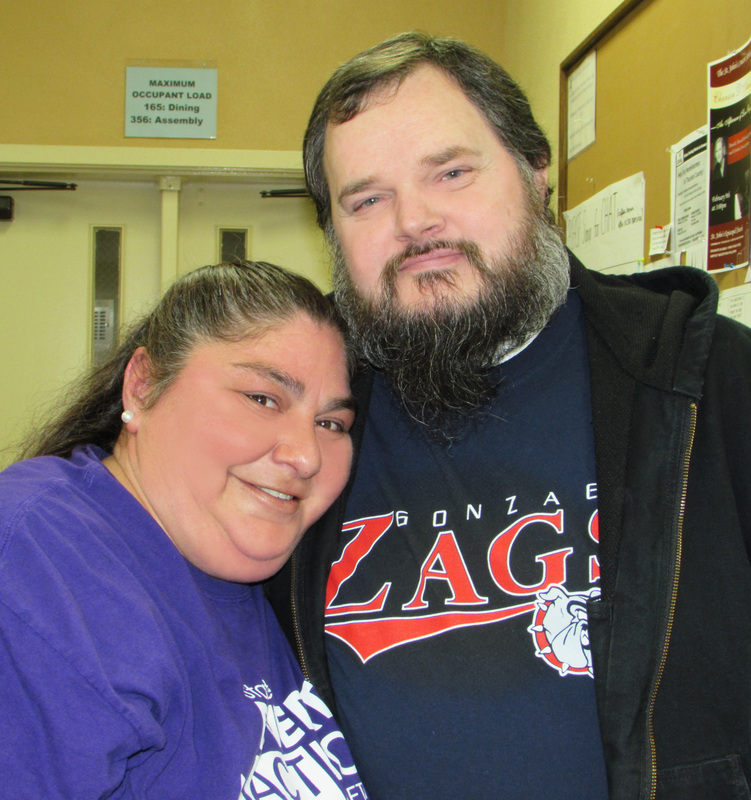 Through it all, our supervisors Mike and Judy were endlessly helpful and gave so much guidance and support to us. 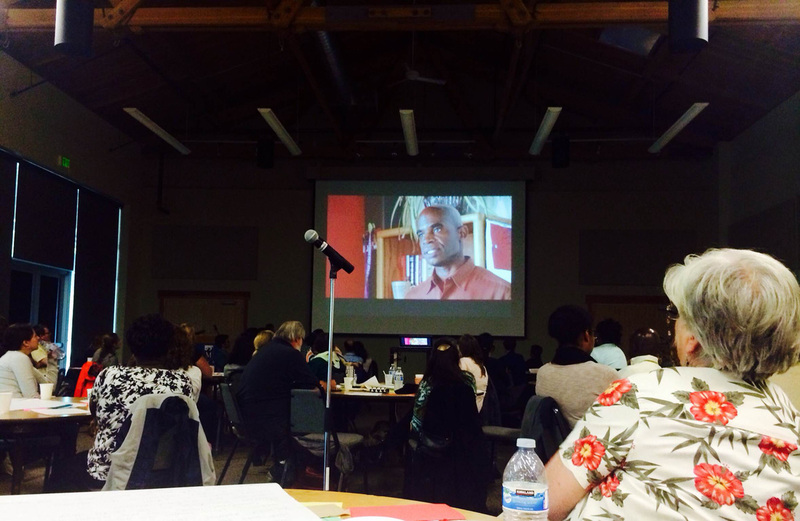 When our video finally got its debut at the All-Staff Meeting on Wednesday, July 23rd, there was a gratifying sense of relief and pride. So many of our coworkers came together to help us and be a part of our video despite their busy schedules, and it was so wonderful for everyone to see the finished product. In honor of Dr. Martin Luther King, Jr. Day, volunteers and members of Feet First – an agency dedicated to creating walkable cities and neighborhoods – set out to clean up a path frequently taken by students on their way school. Drew Devitis, Feet First’s Volunteer Coordinator and a Solid Ground Apple Corps Member, led the project along with Apple Corps Member Zoe Harris. We would like to share the following article Drew wrote describing the project and experience. On a cool, crisp January morning, twenty volunteers gathered at Seattle’s Olympic Hills Elementary School to celebrate the legacy of Dr. Martin Luther King, Jr., and serve the greater community at large. Several compassionate volunteers from Seattle Children’s Hospital and UW Radiology, along with some independent volunteers, joined Feet First in cleaning up the route of a Walking School Bus, a parent-led walking group that leads students to school on “Two Feet Tuesdays.” The passion and commitment from these volunteers definitely fit the character of the day as well as the creative altruism that MLK, Jr. espoused. 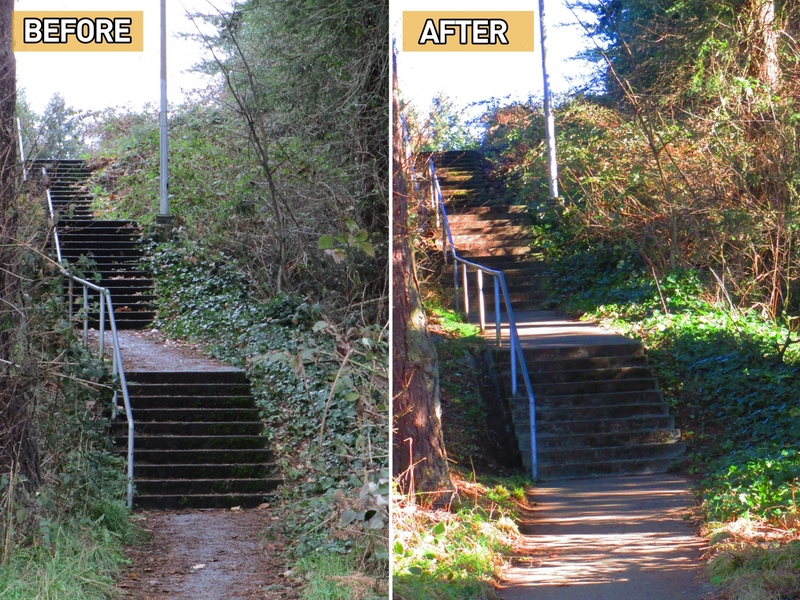 The focus of the volunteer project was on cleaning up a staircase and walkway within yards of Olympic Hills Elementary, which is one of four Seattle schools currently participating in a Safe Routes to School initiative supported by Feet First. This walkway had fallen into disarray over the past several years. Thorny blackberry bushes and wild entanglements of English ivy had been steadily encroaching upon the stairs, making it feel like an uninviting place for kids walking to school. Moreover, rain soaked leaves, slippery pine needles, and other debris littered the walkway, making it potentially hazardous for children and adults alike. In order to approach the task at hand, volunteers formed two separate work groups. One set of volunteers, armed with rakes, brooms and clippers, tended to cleaning the walkway and trimming the vegetative growth that was encroaching the stairs. The other group, equipped with loppers and shovels, concentrated on removing a thick patch of blackberry bushes, which had overtaken the bottom of the staircase and made the path feel like a rather uninviting place. After a few hours of hard work, the staircase and walkway became a much more appealing place to walk. By the end of the day, volunteers had impressively filled up an entire dumpster with invasive species and assorted yard waste. The stairs, which had been obscured by the thicket of blackberries, are now clearly visible from the street. Additionally, mulch was spread throughout the site where the blackberry bushes had once been, creating a warm, pleasing feel. A neighbor driving by in her car even stopped to get out and thank the volunteers for all their hard work in transforming this public walkway into a more pleasant, welcoming space. This project was made possible by volunteers from Seattle Children’s Hospital and UW Radiology through the United Way of King County, and the community of Olympic Hills Elementary School. We’re also thankful for the support of Public Space Management Program, Development Lead Jennifer Wieland and the Seattle Department of Transportation’s Urban Forestry Division, which generously provided the materials used for this project. 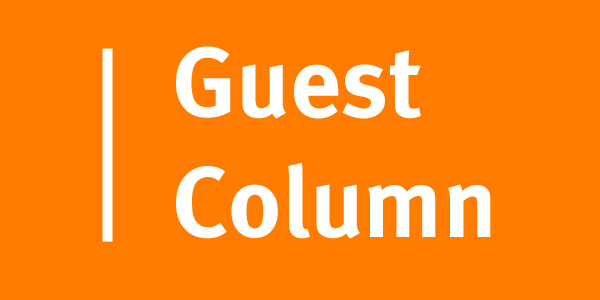 Editor’s note: This article was written by a Feet First volunteer and is reposted from the Feet First! blog. Outfitted in snug caps and down jackets, the volunteers gathered at Seattle’s Dearborn Park Elementary to reflect on Martin Luther King Jr.’s life, the importance of service and community, and the value of maintaining safe sidewalks for students before setting out to restore the school’s Walking School Bus routes. Several volunteers from Seattle Children’s Hospital cited King’s commitment to service as a source of inspiration for the day’s mission. Dearborn Park Principal Angela Sheffey Bogan was motivated by the second-term inauguration of America’s first African-American president, the live footage of which she’d watched with her family that morning. Another volunteer watched a video of King’s “I Have a Dream” with his son the night before. All agreed that joining altruistic forces to make the school’s sidewalks clean and safe was a fitting way to honor the civil rights hero (and masterful marcher) on this eponymous national holiday. Volunteers split into groups in order to tackle five neglected sidewalks. These stretches of concrete, on the north and south ends of the Beacon Hill neighborhood elementary school, were steadily surrendering to the tangle of weeds, ivy and litter that’d been creeping over its surface since the city installed the sidewalks five years ago. For the students treading these walkways every Wednesday as part of the school’s Walking School Bus, the leafy debris and vine-like weeds were an eyesore and a safety hazard. Dearborn Park Elementary is one of four Seattle schools currently participating in a Safe Routes to School (SRTS) initiative supported by Feet First. Principal Bogan, a frequent Walking School Bus “driver,” recognizes the incalculable importance of the weekly tradition. “The value of having a safe and clean sidewalk for my students is immeasurable,” Bogan stressed. Wielding rakes, loppers, and, in some cases, machetes, volunteers set to work. They swept rain-soaked leaves into tidy piles, trimmed low-hanging branches and encroaching English Ivy, and removed thorny Himalayan Blackberry canes. AmeriCorps member Gordon Padelford and Feet First Volunteer Coordinator Darcy Edmunds (a Solid Ground Apple Corps member) offered tips on tool handling (rakes down, shears down, gloves on). Younger volunteers, some who “ride” the Dearborn Walking School Bus, scoured the ground for litter and used litter pickers to lift bottle caps and candy wrappers with a sense of duty that belied their youth. One neighbor came out and applauded the group as they cleared the sidewalk near an empty lot. The stalwart group worked with systematic efficiency until, just a few short hours later, the sidewalks, once slick with leaves and overgrowth, gleamed in all their walkable, gray glory. To volunteer on a project making it easier and safer for people to go by foot, please contact Feet First by calling 206.652.2310 ext. 5 or emailing darcy@feetfirst.org. This project was made possible by volunteers from Seattle Children’s Hospital through United Way of King County, Solid Ground’s Apple Corps, and the community of Dearborn Park Elementary School. Seattle Public Utilities’ Adopt-a-Street program and Seattle Department of Transportation’s Urban Forestry Division generously provided tools used for this event. This post was contributed by Chelsey Loeffers, Solid Ground’s Volunteer Coordinator. Volunteerism in our country has hit a five year high, says the recent Volunteering and Civic Life in America report from the Corporation for National & Community Service. In 2011, over 64 million Americans donated almost eight billion hours of volunteer service to organizations nationwide! Washington ranked 9th out of all 50 states in volunteerism rates; 34.4% of our residents volunteer! Our region specifically also came out on top – the Seattle-Metro area ranks 3rd in volunteerism out of the 51 major metropolitan areas in the country. That’s over 936,000 volunteers! Solid Ground depends on its volunteer force to create positive change in our community, and we are so lucky to live in a community, state and country that values volunteerism. Congratulations to each one of you for being a part of such a positive big picture. For more information about volunteer opportunities at Solid Ground, please contact our Volunteer Coordinator at volunteers@solid-ground.org or 206.694.6825. Find more information about volunteerism in the United States at www.volunteeringinamerica.gov.